Right on the English coast, near Happisburgh, scientists discovered what so far are the earliest footprints discovered thus far in Europe, dated 800,000 years old. Some five human ancestors left these historical footprints in mud on the bank of an ancient river estuary. Perfect timing and the geological circumstances of the time allowed the prints to be preserved until the present. As one might imagine, the chances of coming across a find such as this is extremely rare, after all we’re not talking about some fossil, but one of the oldest walks of fame ever. Only those at Laetoli in Tanzania at about 3.5 million years and at Ileret and Koobi Fora in Kenya at about 1.5 million years are older. If this wasn’t enough, weren’t for the researchers’ keen eye on the site who were there for a completely different matter – a regular geological survey – just two weeks later the tide would have eroded the prints away forever. The team of researchers studied the shallow prints using photogrammetry, a technique that can stitch together digital photographs to create a permanent record and 3D images of the surface. The analysis eventually confirmed that the prints indeed were of ancient human origin, a mix of both adults and children. In some cases the heel, arch and even toes could be identified, equating to modern shoes of up to UK size 8. 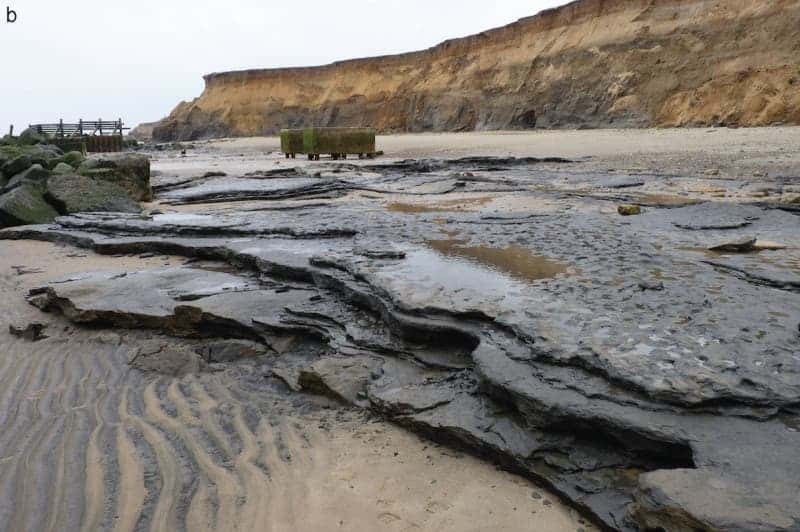 This latest find joins other breakthroughs gathered from the area, since a series of sites with stone tools and fossil bones have been discovered in the same sediments at Happisburgh over the past 10 years. It’s impossible to tell what the ancient humans were up to from the prints alone. Some 800,000 years ago Britain was a whole lot different. First of all, it wasn’t much of an island, since it was linked to continental Europe. Ancient mammals like bison, mammoth, hippo and rhino grazed the river valley at Happisburgh, while our early ancestors were surely lurking about next to them. The findings were reported in the journal PLOS ONE.